Source to Amaq Agency: the armed attack that targeted a gay nightclub in the city of Orlando in the U.S. state of Florida and left more than 100 killed and wounded was carried out by a fighter from the Islamic State. Although not framed as an official claim and citing an anonymous "source," the statement must be taken as definitive. Amaq News is a central part of the Islamic State's media operation. All prior claims for terrorist attacks in the West via Amaq News in the first instance have proven to be accurate. 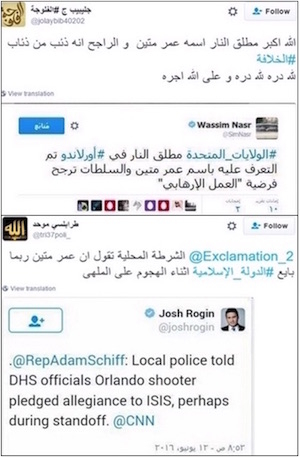 Mateen, it is now known, pledged allegiance to Islamic State and has a father who supports the Taliban. 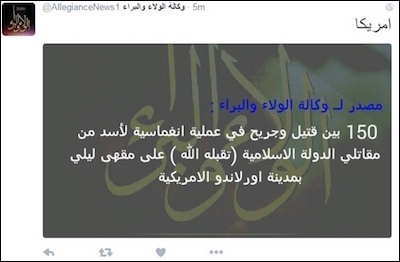 Prior to the Amaq claim, there was much speculation on pro-Islamic State social media accounts. Some pro-Islamic State accounts have relied solely on what is already being circulated in the media to see if there is the Islamic State link they hope for. Above left: "Allahu akbar. The one who opened fire: his name is Omar Mateen and the likelihood is that he is one of the wolves of the Caliphate" (relying on reports that authorities consider the act an incident of terrorism)." Below left: "The local police says that Omar Mateen perhaps gave allegiance during the attack on the nightclub"
Only one pro-Islamic State outlet from within Islamic State territory previously claimed the attack. The outlet is known as Wala and Bara Agency. Wala and Bara, for context, is a key concept in Islamic State religious doctrine (but by no means unique to the Islamic State) that teaches love of anything associated with Islam and Muslims and hatred of anything associated with the disbelievers. In some ways Wala and Bara Agency imitates the IS 'auxiliary outlet' Amaq News, in that certain terminology is used to convey a sense of objectivity (e.g. 'fighters of the Islamic State', rather than the more usual term 'mujahideen') and the outlet's emblem avoids something that can definitively connect it to the Islamic State (i.e. in the case of Wala and Bara Agency, it uses a regular black flag of jihad, not the Islamic State flag). That said, the outlet is less consistent than Amaq in following "auxiliary outlet" guidelines, and recently opted for the use of the term 'Crusader alliance' in reference to the international coalition (Amaq News would never use such terminology). The outlet appears to be linked to a pro-Islamic State activist called Abu Emad al-Nayrabi, whose name suggests he is originally from Nayrab in the Aleppo area. At present, he seems to reside in the Islamic State-held town of al-Ra'i, on the border with Turkey. The claim was posted as follows (at right): "Source to Wala and Bara Agency: 150 among the killed and wounded in an inghimasi ['commando'] operation carried out by a lion from the fighters of the Islamic State (may God accept him) on a night-cafe in the U.S. city of Orlando." If we are to be sure of the Islamic State link, then more evidence needs to come out. For example, it would need to be shown conclusively that he pledged allegiance to the Islamic State, or an outlet like Amaq News/the Islamic State's al-Naba' newsletter/the Islamic State magazine Dabiq would need to claim the attack, which may happen at a much later date. If this is the case, then it is hardly a surprise given that Islamic State spokesman Abu Muhammad al-Adnani called for more attacks by Islamic State supporters in the West if the opportunity for hijra to the Islamic State territories is closed off to them, as part of a recent speech in which he acknowledged problems of territorial losses for the Islamic State though asserted that losing towns and strongholds would not be the end of the Islamic State.